The catalyst in a variety of ways for a loaded Kansas Players squad that features fellow first team member Jaylon McDaniel, Stevie Strong Jr., etc. Jones had an exceptional opening weekend and during the championships he was solid and consistent as he contributed across the board and made big plays when it mattered the most. A skilled young forward who can finish at each level, Jones is a multi-faceted young talent whose best basketball lies ahead. An advanced skilled young talent with instincts and feel, Austin was consistently dominant throughout the league play and during the championship weekend as he posted double double efforts in efficient fashion. He was among the league leaders each weekend in overall floor impact, matrix, and efficiency. A solid young talent who knows how to play, Austin had a great GNBA campaign this past spring and summer. 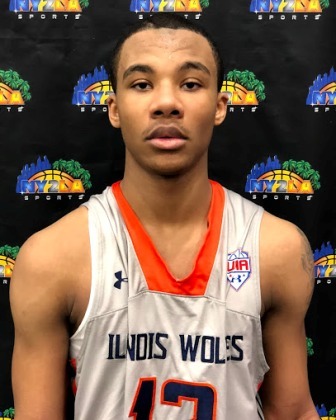 A solid young interior talent with size and length for his current age, McDaniel was a force on the defensive end of the floor as he altered and blocked shots while being equally disruptive to anyone who attacked or tried to score around the basket. Mix in solid rebounding, an ability to score around the basket, and just the mere dominant presence he brought to the paint for his team, McDaniel was a key factor in controlling teams defensively and helping the Players to another undefeated championship run. Delivered a statement weekend during championship play as he led the league in six key categories (i.e. Floor Impact, Matrix, Efficiency, Points Per Game, and Assists Per Game, Steals) during the final weekend of play. An exceptional young guard with instincts, feel, advanced skill, athleticism, and quickness, Sayles is legit and only getting better. He can score off the bounce and with his perimeter jumper, he sees the floor well and creates, and he’s a potential lock down defender who is disruptive both on and off the ball. One to watch. The floor general for a balanced and talented All Ohio Purple squad, Walker handles the ball well and he can create and defend in the same sense. Had his best efforts during the opening weekend of play where he made quality decisions and opened the floor up with his efficient perimeter shooting and playmaking. A solid young floor general with feel and skill, Walker opened some eyes with a solid effort this past spring and summer.